Also at Pixelsurgeon: Win original Frazer Irving artwork! 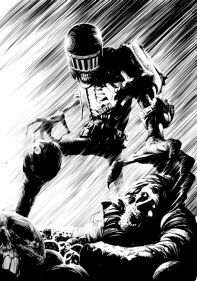 This black and white, ink on paper rendering of Judge Dredd's arch enemy, Judge Death, measures approximately 300mm x 420mm (roughly A3). Navigate the fiendishly easy online form, and the Dark Judge himself could be hanging over your mantle piece this new year!